The purpose of this article is the creation of a flash cartridge for the Speak & Spell by Texas Instruments (further refered to as S&S). 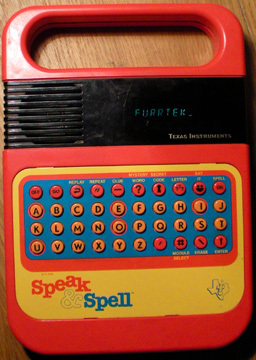 This educational electronic toy was released in 1978, its main goal was to help children learn to write some words by dictating them from a list via a loudspeaker and then asking to spell them correctly thanks to a keyboard and an alphanumeric display. Although this toy was relatively popular in its era due to the innovation and nowadays due to the many fans of circuit bending, the technology that was developed to reproduce the sound of words and phrases wasn't that much evoked even though it was a true technological achievement. The built-in memory included between 150 and 200 words depending on the version, and an expansion port was available to increase the word count using themed cartridges sold separately. The idea of such a flash cartridge filled with stupid words was given to me by [Yotie] during a discution in a queue at Disneyland, if it matters to you. I had then no idea what to expect, and did not expect to meet such a challenge from a toy so old ! Before going into details, I want to thank [Grapsus] (grapsus.net) and [Lord Nightmare] (wikipedia) without whom this project would have lasted an eternity. And also PanterA for the French proofreading.